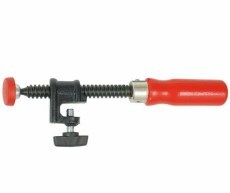 Edge Clamp Device from Bessey Attachment adaptable to many brands of F clamp which allows secondary clamping for edging, trim, veneers, etc. Can be used with most standard screw clamps with a maximum bar thickness of 13 mm. Spindle length 75 mm.